I noticed that the terminating resistor value and material/type for good working Beverage receiving antenna for low bands DX-ing is never ending story and object of many discussions and internet threads so I decided to post over here few useful information in order to help those guys who do not want to spend annoying time to browse and investigate about this topic. 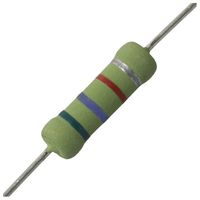 The important is to look for carbon composition / ceramic composition resistors at 2W power rating at least. The Ohmite has their OY series / 2W for example. It is highly recommended to put a 75V 10 kA GDT in parrallel with the resistor at the end of the beverage antenna. The 10 pack at $1.41 and it will last a long time in the field.